The '70's was sort of a dark period for American Cars. It's generally not considered the heyday of American muscle and the number of cars that were copied into 1/25th scale is much smaller than those done from the '60's. There are a few over looked gems out though there that have street machine potential and haven't been done to death. The MPC 2-door Dodge Monaco Sport is one of those models. I rarely see these built and so I thought that was a good enough reason alone to do something with one. MPC originally tooled this kit as a Plymouth Road Runner in 1975. Then it was updated to a Dodge Monaco in 1976. It was re-issue again as a '77 and then the tooling was converted into a 4 door sedan later in the '80's making re-issuing this tool as a 2-door again unlikely. The 4-door version has been re-issued again and again as various police cars, but the 2-door is much harder to come by. I picked up this previously built model from ebay. It was cleanly built, but I wanted to make a pro-touring style street machine out of it, so I disassembled it and stripped it's old red paint. After tearing down the old model I shaved the body of door handles and emblems for a clean custom look. I wanted my Monaco to incorporate many Mopar Muscle styling cues from the '60's. One of these was the use of a Shaker hood scoop. 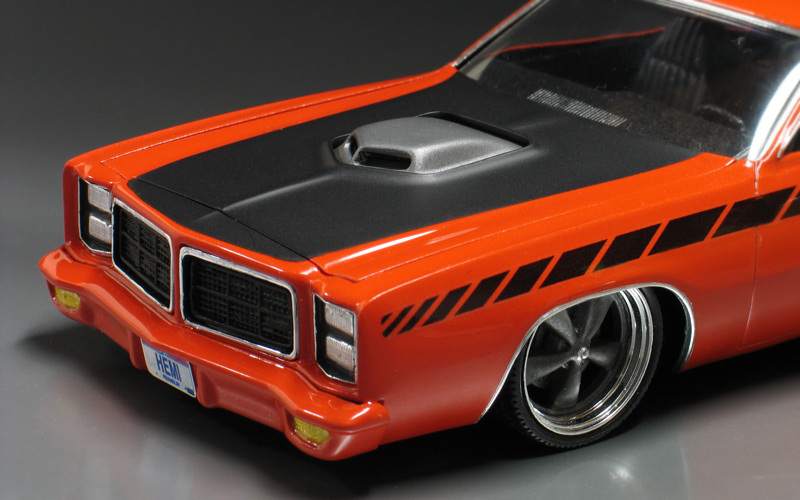 For this I cut the hood scoop from a Monogram '71 Hemi 'Cuda and grafted it onto my Monaco's hood. 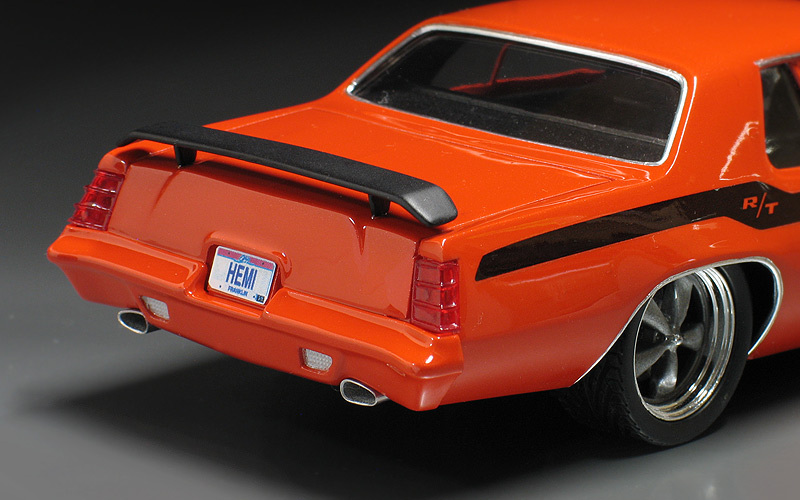 The 'Cuda kit also provided the Mopar accessory rear wing. 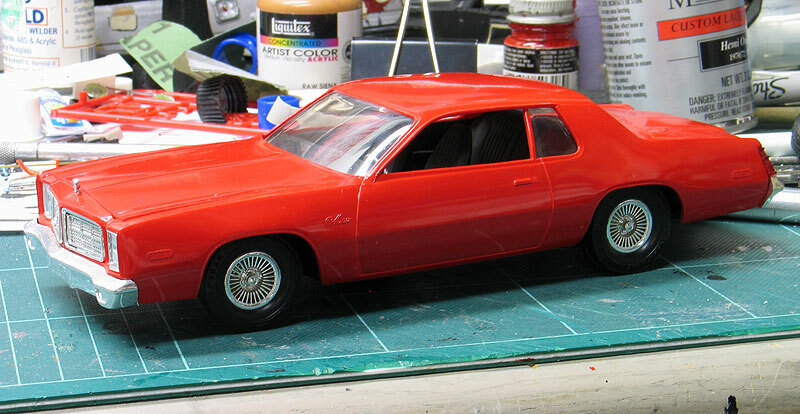 For paint I sprayed the body with Testors lacquer "Hemi Orange" which was a 1970-1971 special order high impact color. 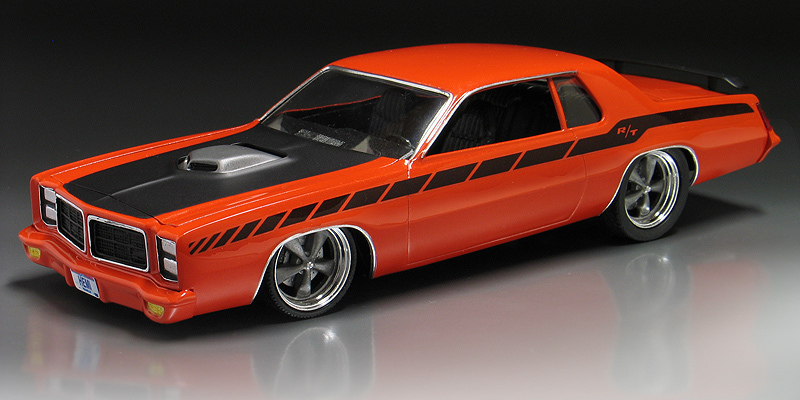 I painted the bumpers body color because this was a option available on several Mopar muscle cars during that time. It also helps those big 5mph safety bumpers visually blend into the body shapes a little better. I wanted to add some R/T side stripes too. I ended up designing my own version of the strobe style stripe design inspired by the '70 AAR 'Cuda. I laid out the graphics on my computer and then printed my own decals. The paint and decals were then covered with PPG urethane clear. Lastly the hood was painted flat black. To complete the modern pro-touring look, I used a set of Pegasus "T"s wheels and mixed the tires from several different sets to get a big and little combination. The big brakes are my own resin pieces cast from a Tamiya WRC focus.